It would be quite a fishy thing if a cat wouldn’t run after fish! Especially if it is a strong-flavored one like tuna. Many of you must also be sharing your tuna sandwich or tinned tunas with them! In fact, a tuna-addicted cat has been nicknamed as a ‘tuna junky’. 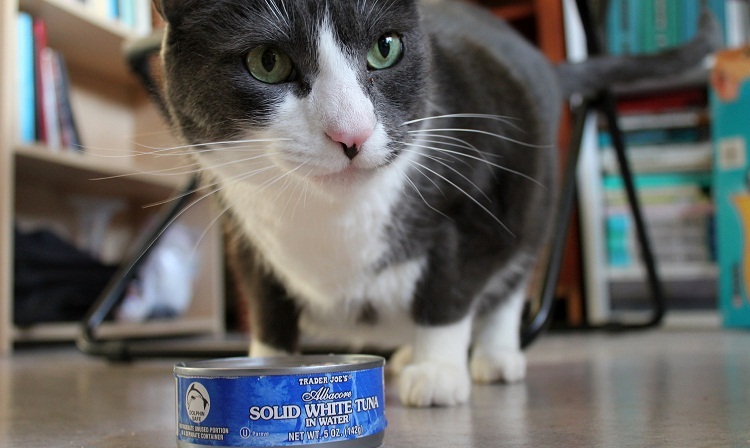 However, the question is – how safe tunas are for our feline friends? A spoonful of cat-food tunas, once or twice a week simply as a treat is still ok. But a regular tuna diet for a cat is a strict no-no. Let us analyze why. Tuna is not deadly to cats, but it is safe not to feed your cats with tuna. As an upper food-chain fish, it is one of the most mercury-contaminated fish today, and hence, a frequent diet consisting of any variety of tuna can easily lead to mercury poisoning. You should also remember that tunas, canned, or brined, in any kind of oil (like vegetable, sunflower or olive oils) that are meant for human consumption might cause digestive imbalances in cats, leading to severe stomach disorders even if given as an occasional treat or even in small amounts. Tuna has an exceptionally high level of unsaturated fats which is good for humans, but bad for cats. Finally, also remember, like all other raw fish, raw tuna contains enzymes that can destroy the B-vitamin present in your cat’s body, leading to neurological disorders including seizures or coma. So keep it out of reach. However, if you would still feel like a selfish munching tunas alone, while you see your kitty keeps meowing for a little share, then it’s better you keep a can of tuna cat food ready. But make sure you collect it from a good pet store, and the brand is well-reputed. Published on November 30th 2017 by Shiloh Nevada under . Article was last reviewed on 30th November 2017.